At the July 23, 2012 convocation of Conlegium Ritus Austeri #779, the members of the lodge presented the newly restored portrait of Past Grand Master Charles Comstock. Most Worshipful Bro. 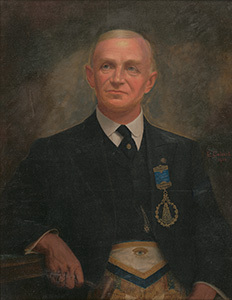 Comstock served as Grand Master of Masons in Tennessee during 1913. The lodge enjoyed an informative presentation on his life by Past Grand Master John L. Palmer. Below, the members of Conlegium Ritus Austeri #779 present the newly restored portrait to the Grand Historian, Worshipful Bro. Walter Seifert Jr.